The beaches are the star of the show here, with golden sand, calm clear water and plenty of choice. You can head for Platgetes if you enjoy snorkelling - there are quiet hidden coves with plenty of rocks and outcrops to explore. If you have young children, L’Ampolla, a man-made beach, is ideal as the sand gently shelves into the sparkling blue water, perfect for small people to paddle and play. If you enjoy a challenge there are various water sports on offer, such as paragliding, water skiing and scuba diving. If you prefer to stay dry, there is excellent golfing around here as well as go-karting! The prettiest beach is also the smallest, a hidden gem called El Portet, by the marina. You get to this gorgeous, idyllic spot along a winding road, just 5 minutes’ drive from the town and it has a few bars and restaurants to keep you refreshed and well fed. 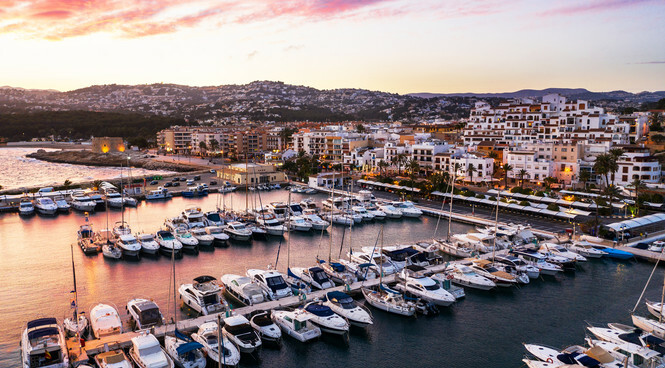 Moraira is full of stylish cafes, there’s almost no need to eat at your villa, bars and restaurants allow you to enjoy fish and shellfish caught that morning as well as traditional tapas alongside fish and chips, curry and pizza. If you are feeling bold try the octopus stew or rice blackened in squid ink! The main fish restaurants overlook the small port and fish market. The town is not a chilled out place at night but there is live music in one or two bars and a small nightclub. You can also watch a traditional flamenco performance if you are in the mood. 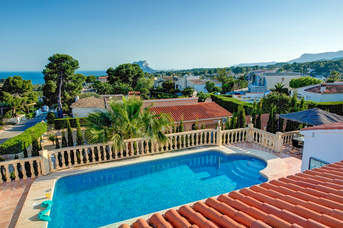 Moraira is small, compact and easy to get around, which maybe one of the reasons for its huge popularity as a retirement town for expats, especially the British.The beaches are the star of the show here, with golden sand, calm clear water and plenty of choice. You can head for Platgetes if you enjoy snorkelling - there are quiet hidden coves with plenty of rocks and outcrops to explore. If you have young children, L’Ampolla, a man-made beach, is ideal as the sand gently shelves into the sparkling blue water, perfect for small people to paddle and play. If you enjoy a challenge there are various water sports on offer, such as paragliding, water skiing and scuba diving. If you prefer to stay dry, there is excellent golfing around here as well as go-karting! The prettiest beach is also the smallest, a hidden gem called El Portet, by the marina. You get to this gorgeous, idyllic spot along a winding road, just 5 minutes’ drive from the town and it has a few bars and restaurants to keep you refreshed and well fed. 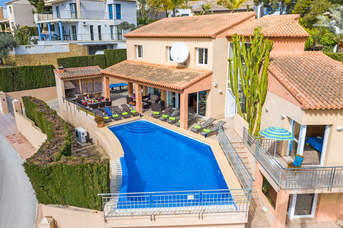 Moraira is full of stylish cafes, there’s almost no need to eat at your villa, bars and restaurants allow you to enjoy fish and shellfish caught that morning as well as traditional tapas alongside fish and chips, curry and pizza. If you are feeling bold try the octopus stew or rice blackened in squid ink! The main fish restaurants overlook the small port and fish market. The town is not a chilled out place at night but there is live music in one or two bars and a small nightclub. You can also watch a traditional flamenco performance if you are in the mood. 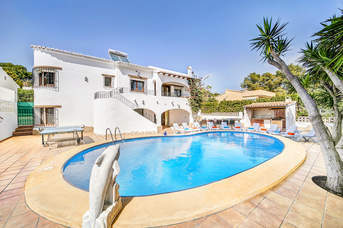 Moraira is small, compact and easy to get around, which maybe one of the reasons for its huge popularity as a retirement town for expats, especially the British. Every Friday Moraira hosts one of the biggest markets on the Costa Blanca, in a large car park near the Centro de Salud. This is a great place to shop if you do want to put your Villa Plus kitchen through its paces! You will find a huge array of locally grown fruit and vegetables, and if you want to take a paella pan home, no problem! You will find it here alongside shoes, shampoo, spices and swimming gear! Pottery and sunglasses, rugs and watches – you’ll be amazed at what you can find. There is also a smaller, more traditionally Spanish market every Wednesday in nearby Teulada, which is actually the old town of Moraira. 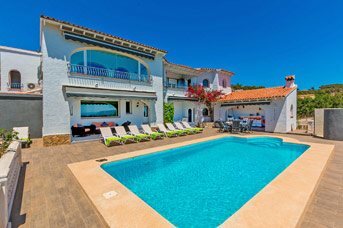 For more shopping wander around the backstreets of Moraira and you will find interesting jewellery shops, top-label designer boutiques, good leather shops and some funky art galleries. 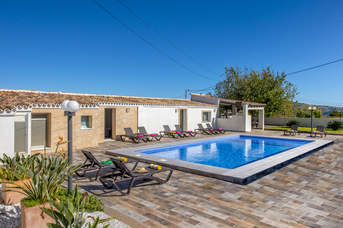 The Moraira region has more than 1,000 hectares of vineyards and is famous for growing Muscatel grapes for wine-making as well as dessert grapes and raisins. The vineyards tend to be up in the hills where the land is cheaper and the climate is a little cooler. The San Vicente Ferrer Cooperative makes excellent mixtures such as Villa Teulada white wine and sweet Muscatel. Do try some before you go home! There is a Moscatel Festival in early September. By way of contrast, if you would like a break from driving, take the tram, running along the Costa Blanca, between Alicante and Denia. Jump on a tram to either Gata de Gorges or go a little further to Denia for a day out. To get to Alicante you change trams at Benidorm. The trams run every hour. You can sit in comfort and marvel at the wonderful west Mediterranean landscape.